Occasionally it gets boring thinking of recipes for green juice smoothies, so as suggested of Institute of Integrative Nutrition, my health coaching school, I ordered Superfood Smoothies by Julie Morris. Besides getting to look at a whole book of different exciting recipes, Morris, a natural food chef, takes this blended drink business, one step further and shows us how loading her “thirst clenching recipes with the healthy goodness of super foods” — A smoothie will be even more remarkably beneficial to our health. For her 100 recipes she selected 15 main incredible nutrient dense super foods full of vitamins, minerals, antioxidants, and phytochemicals. Some are the following ingredients … Goji berries, Cacoa, Chia Seeds, chlorophyll-rich Superfoods, Maca, Noni, Aloe, etc. Wanting to go a little different than my green juice with kale or spinach, today I tried the Pistachio Cherry. Definitely a nice sweet change of pace. This recipe makes 2 16 ounce servings. I cut it in half, just in case I didn’t like it. I knew I can always make more. And I assure you I will try this again. Yum Yum! sweetener, to taste (optional), I did not see the need to add sweetener. Blend together all the ingredients, except the ice, until creamy and smooth. Add the ice and blend until frosty. Taste, and sweetened as desired. 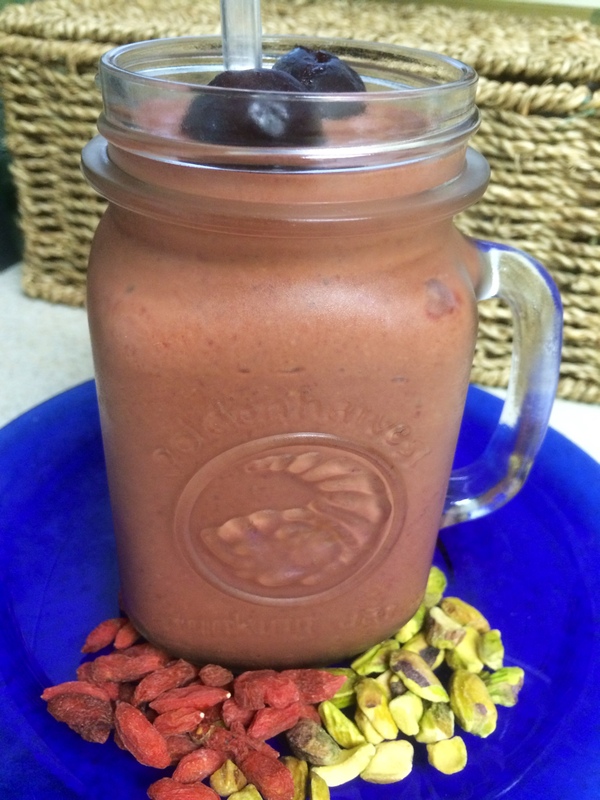 The SUPERFOOD BOOST for this recipe is add 1 tablespoon cacoa powder. Let me know what you think in the comments or if you have any questions, feel free to ask.